Learn the reason behind the name of this Easy Strawberry Trifle. 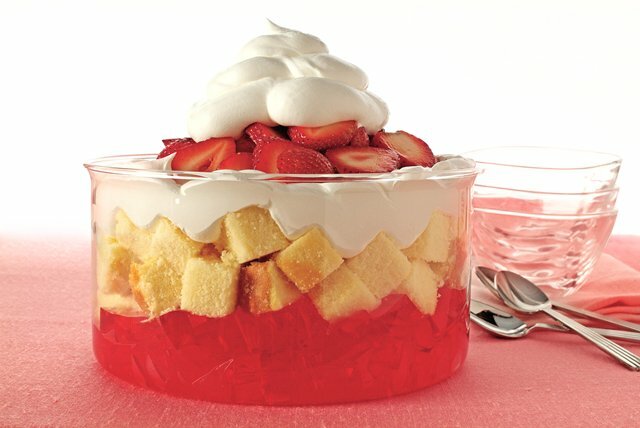 Our JELL-O-filled Easy Strawberry Trifle is fridge-ready in just 20 minutes. Stir boiling water into dry gelatin mix in large bowl at least 2 min. until completely dissolved. Stir in cold water. Pour into 13x9-inch pan. Refrigerate 3 hours or until firm. Prepare as directed, using COOL WHIP LITE Whipped Topping and fat-free pound cake. Prepare as directed, using 2 pkg. (4-serving size each) JELL-O Strawberry Gelatin. For a festive holiday dessert, prepare as directed using 2 pkg. (4-serving size each) of any 2 different flavors of JELL-O Gelatin. Dissolve each flavor gelatin in separate bowl, using halfeach of the boiling water and cold water for each flavor gelatin. Makes 18 servings, 2/3 cup each.